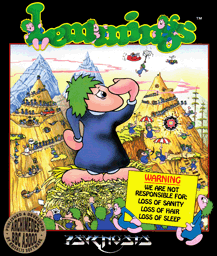 An intriguing game in which you help hordes of mindless but delightful creatures - known as Lemmings- to escape hostile environments in over 100 levels. Lemmings drop through a trapdoor in each level and as they are creatures of very little brain, they need all the help they can get to survive the dangers that lie within. Lemmings are very cute but also very dumb. They will mindlessly walk off cliffs, into water, hazards and traps or they mill around bumping into walls or other obstacles unless you help them get their act together. You can assist them by giving them certain skills and powers that will help them get through each level of the game. 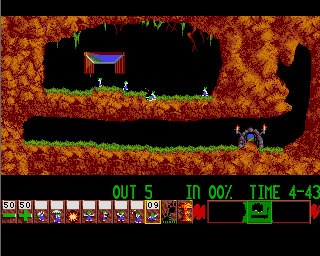 Once you have assigned skills (shown as icons on the bottom of the screen in each level) to certain Lemmings they can use those skills to help them and their fellow Lemmings cope with the dangers that surround them. 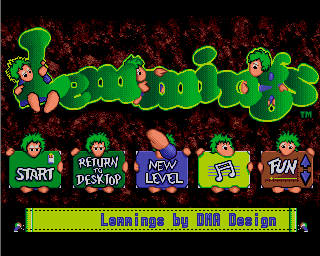 Each level of the game is an increasingly difficult environment that the Lemmings must navigate, At each level you have a different number of skills available for assignments, you have different times available for mastering that level and you have varying numbers of Lemmings that you must save to complete that particular level. A quick brain, the ability to plan ahead and lifetimes dedication to the Save A Lemming Campaign are required to get the right Lemming to perform the right action at the right time. A forgotten blocker, a rogue miner or a misplaced bridge could spell disaster for every Lemming on the screen. As per the instructions I loaded the disk and used the "Boot Floppy" option (tried with and without CTRL pressed) and got Internal error: abort on data transfer at &000407E8 - am I missing some setting or something to get this working. This is on my Model B Pi with the latest Risc OS Open installed. Qjimbo wrote: As per the instructions I loaded the disk and used the "Boot Floppy" option (tried with and without CTRL pressed) and got Internal error: abort on data transfer at &000407E8 - am I missing some setting or something to get this working. This is on my Model B Pi with the latest Risc OS Open installed. Lemmings appears to be broken on the 2.43 beta. Use the 2.41 beta for Lemmings until I find out what's causing the problem. The mouse does not respond and the game freezes after a few seconds (sometimes the mouse works for a second before stopping). The mouse cursor in the screenshot there doesn't show up until the game freezes. Qjimbo wrote: I have tried both beta versions now (I was using an old release before - oops!) and I get this strange duplication issue on both versions. Doesn't look like it's running under the JIT, do you have SparkFS loaded? Which version of ADFFS are you using and are you running a recent alpha of RO5.21? Qjimbo wrote: The mouse does not respond and the game freezes after a few seconds (sometimes the mouse works for a second before stopping). The mouse cursor in the screenshot there doesn't show up until the game freezes. The game is crashing, the cursor shows when RISCOS tries to go back to the desktop. For Lemmings to work on the Pi, you need the ADFFS 2.41 beta (2.43 broke it, which I'm currently looking at) and a build of RISCOS after 20-01-14. I have just re setup my Raspberry Pi again (I had to give the monitor I was using back - I was borrowing it! Just got another monitor recently), I'm going to try this again this evening and report on the findings. Sorry for disappearing before! Unfortunately I get the same doubling issue with ADFFS 2.41b and 2.5b versions. On RISC OS PI v5.21 (17-Feb-2015). Quite surprised since I saw you had it working yourself on your Youtube channel. No idea what I'm doing wrong. Do any of the supported games work on your Pi? Or is it just Lemmings that's having problems? Just tried Pacmania - same issue. SparkFS loaded, ADDFS 2.5b, latest stable release of Risc OS Pi. If you get a double image, it's possibly your monitor setup blocking certain MODEs.